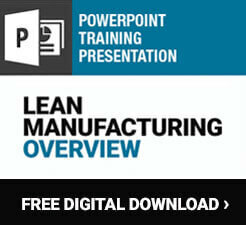 Lean manufacturing is a business model. It's a method of approaching work that seeks to deliver high-quality products or services to customers as efficiently as possible. It ensures value by identifying waste within the value stream and eliminating it whenever possible. Lean manufacturing, often referred to as just "Lean," has been implemented in businesses and organizations across many industries and in many work settings such as manufacturing, healthcare, offices, and government. It involves people in all aspects of an organization in improving processes and reducing waste. Lean is a set of tactics that can be implemented to improve the workplace, but it is also a way of thinking about work. Lean organizations constantly look for ways to make improvements. Rather than waiting around for something to go wrong and then making changes, businesses that employ Lean proactively seek possible changes. Organizations that decide to adopt Lean manufacturing must first understand the origins and aims of this methodology. Then they should provide the necessary training and support so that processes, people, and the culture of the workplace can successfully make this shift. Lean is not a system that can be implemented overnight, but when businesses spend time on Lean, they often see significant increases in productivity, efficiency, and value. Leaders at the Toyota Motor Company in Japan, however, were among the first to bring together many of these ideas into a cohesive methodology. 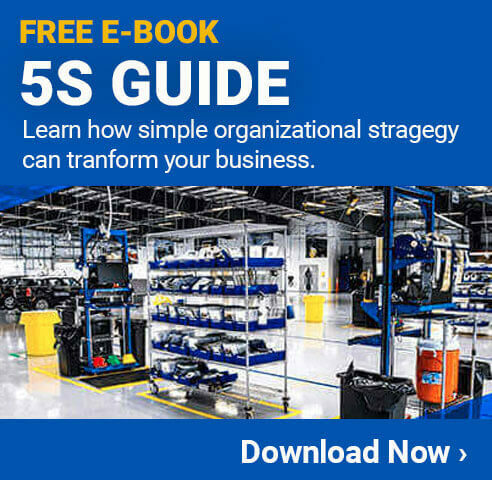 This system, called the Toyota Production System (TPS), began to emerge at Toyota after World War II when the automaker was seeking ways to make itself more competitive and to streamline processes. The term Lean manufacturing itself emerged in the late 1980s among researchers, writers, and consultants who had studied the way automobiles were produced in Japan. "Lean manufacturing" is often used in the West to refer to the Toyota Production System. Several books published in English in the nineties helped spread TPS ideas around the world, and today, companies in a wide variety of industries and countries utilize Toyota's methods. Many of these goals are achieved by identifying areas of waste. This is often done by examining the current state of the workplace, sometimes using what is called a value stream map. This map looks at the way materials or information flow through the process, where materials are stored, when materials arrive, the time it takes for steps in the process to occur, and more. It provides people with the information they need to assess the value creation process from beginning to end. These activities are the most important part of a process from the perspective of the customer. Non-value-added activities consist of those tasks that must be performed, but that the customer doesn't see as adding value to the actual product. For example, complying with a government safety regulation during the manufacturing process may not influence the customer's decision to buy the product, but it is something that must be done anyway. The third type of activity-and the most problematic-is waste. Waste doesn't add value and it doesn't need to be done to complete the product or service in question. This is what Lean manufacturing seeks to eliminate. An eighth waste, unutilized talent or skills, is often added as well. In addition to identifying these types of waste, Lean also tries to eliminate mura, or unevenness in production, and muri, the overburden of people or equipment. These problems with the flow and level of production can lead to fatigue, breakdowns, safety issues, and other undesirable situations. In a Lean operation, processes flow smoothly and contain the least amount of waste possible. This allows high-quality products to be delivered to customers on time, in the quantities they desire, and for a price they are willing to pay. Note: When people hear the term Lean, they often worry it means eliminating people. This is not the case. In Lean manufacturing, people are what make the system work. Respect for people is an integral part of Lean. People understand their own tasks and processes and are in the best place to try to improve them. Rather than seeking to eliminate people, a Lean workplace should seek to eliminate waste. When this means a task is eliminated, the person who performs that task should be reallocated elsewhere rather than let go. The Toyota Production System "House"
TPS and Lean involve many tools that organizations can use. Some of these tools are fundamental to Lean and are necessary for creating a successful Lean environment. These concepts and tools are often depicted in the form of a house, called the house of lean. Beneath these goals are two pillars that are what keep TPS running: Just-in-time production and jidoka. Just-in-time (JIT) production refers to a method of production based on customer demand instead of on traditional demand forecasting. JIT is often considered the basis of TPS. In JIT, when a customer orders products, this triggers the upstream process to begin making those products. This method is often referred to as a pull system because production is pulled by customer orders. A pull system is preferable to a push system (demand forecasting based on projections and historical data) because it allows a business to reduce wastes such as excess inventory and overproduction. Within this system, the term takt time refers to the amount of time it takes to fulfill customer demand, and processes are adjusted to takt time to prevent overproduction or underproduction. Jidoka, the second pillar, means "autonomation" or "automation with a human touch." In a manufacturing process, this could mean machines are designed so they automatically stop when something goes wrong. This way, defects are immediately detected. This also frees up people to oversee more machines at one time. Jidoka helps improve quality by catching defects so the problems that cause them can be resolved. Several other Lean tools such as poka-yoke and andon boards/signals can be used in conjunction with jidoka. Poka-yoke means "mistake proofing." Poka-yoke techniques prevent errors from occurring, and they're common even in everyday life. For example, bathroom sinks have a hole near the top to prevent water from overflowing if someone accidentally plugs the sink and leaves the water running. In a manufacturing facility, machine guarding techniques such as light curtains sense when someone is too close to a dangerous part of a machine and automatically turn it off to prevent an accident. Poka-yoke is simple, but it prevents human error from causing problems. An andon is a signal that alerts people to a problem with the process. The andon could be a light that changes color from green to yellow or red to signal something is wrong. Andon boards where people post information about the status of production are also common. All of these andons help reinforce jidoka by alerting people to issues. At the base of the TPS house - the foundation - are the tools that help stabilize a business. They are called heijunka, standardized work, and kaizen. 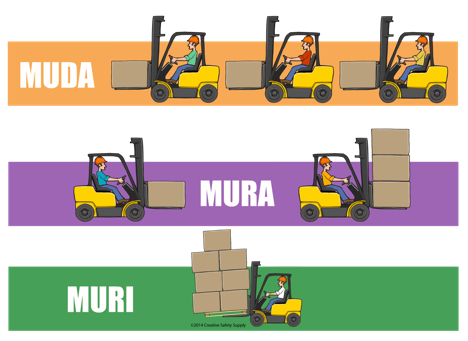 Heijunka levels production volumes in order to eliminate mura (unevenness). This allows production to flow smoothly and efficiently. Unlike mass production where large batches of one item are made, heijunka focuses on designing processes that can switch from one product to another quickly. This is beneficial because then processes can better meet demand. In mass production, stockpiles of some products may build up while customers wait for completely different products. When heijunka is used as part of a JIT system, a process can make a small amount of one product and then easily switch to making another product to fulfill a customer's order. Standardized workis also a significant part of the foundation of TPS. Standardized work, or standard work, consists of the best practices for performing a task. Ideally, standardized work is documented and people are trained on what it is. Without standards, it's difficult to make meaningful process improvements. Standardized work is the baseline from which activities can be improved, and as such it serves as the basis of many Lean practices. 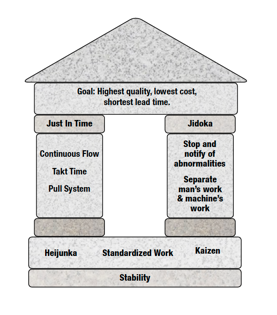 Finally, kaizen is both a methodology and a philosophy that is fundamental to Lean manufacturing. Kaizen means "continuous improvement. Once work has been standardized and production leveled, Lean still seeks ways to improve these things. That's where kaizen comes in. It can mean several things in the workplace; kaizen is either a short event where people focus on improving a particular task or process or it's something performed by people on a daily basis. 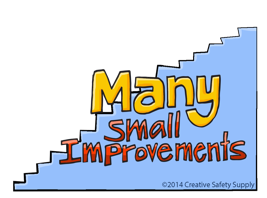 In the latter case, everyone looks for small ways to improve processes regularly. Over time, kaizen becomes a mindset. Together these techniques serve as the basis of TPS. The Toyota Production System stabilizes processes, it makes production flow smoothly based on customer demand, it identifies defects to improve quality, and ultimately it delivers what the customer wants.